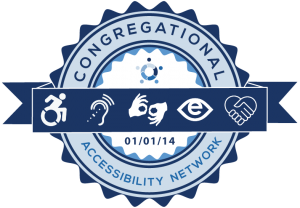 Why should you and your congregation care about the Congregational Accessibility Network (CAN)? What does CAN offer you? What does CAN offer your faith community? In addition to the scenario presented below, you can download a one-page CAN Introductory Sheet to distribute. Imagine you have just moved to a new city and you would like to become involved in a faith community. A wheelchair is part of the everyday way you get around in the world, so naturally you want to find a place to worship that does not impose obstacles to your participation. How will you figure out which houses of worship in town have buildings that are accessible to you? A congregation advertises in the local newspaper that it is accessible to people with disabilities. How will you know if it really will be accessible to you? Perhaps you can get in the door of the building and into the main worship area, but what about the classrooms? What about the restrooms? Will you be able to manipulate the doorknobs with your fine motor limitations? Will you be able to exercise your gift of leading singing, or is the platform in front of the sanctuary inaccessible? How awkward will it be that you need your spouse’s assistance to use the restroom? Imagine too that your family includes a daughter who has Down Syndrome. She can get around the facilities easily enough, but you wonder which congregations in the area will have teachers and youth leaders trained to be supportive to her particular needs. Is there anything in a congregation’s program that will encourage her peers to make friends with a child who is different? CAN exists so your congregation can know and present this information to actual and potential attendees. CAN is a network of individuals, congregations, conferences, denominations, and organizations promoting accessibility and a welcoming spirit among faith groups toward persons with any kind of disability. CAN offers tools to such congregations so that they become more accessible and then communicate an inclusive spirit to all who would come through their doors. In your search for an accessible congregation, you are relieved to see the CAN seal on the website of several churches you are considering. 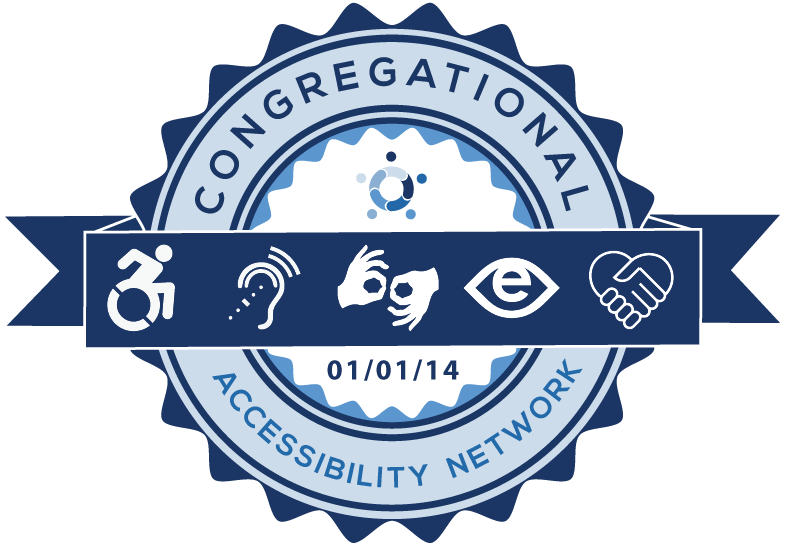 When you hover your cursor over each of the emblems (the square symbols) on the CAN seal, a menu drops down detailing the specific steps that congregation has taken to be accessible to people with disabilities. Dropping down from the wheelchair symbol you see a list of steps the congregation has taken to be accessible for those with physical disabilities. The support symbol (clasping hands, on the right) displays a drop-down menu of steps the congregation has taken to support inclusion of persons with disabilities through awareness-raising, education, support groups, and provision for individual differences. Other symbols reveal supports for persons with hearing or vision impairment, or who communicate with sign language. The detailed information given helps you know what to anticipate as you visit the churches that appeal to you. The challenge of completing the survey has enriched the congregations that have used it by spurring them to take additional steps to offer God’s welcome to those who live with disability. Won’t your congregation join the network? Become part of a movement to help persons with disabilities feel welcomed and included!